Lost In The Warp: Trollbloods know how to Rok...TO THE EXTREME! Trollbloods know how to Rok...TO THE EXTREME! So yeah.. EXTREME Rok. Since I already bought the extreme mauler just to get the base for my MEGA Mulg, I found myself with this great big lump of metal left behind. I didn't really need another mauler, so Rok it was ! Ok so yeah I planned it all along. Rok is such a super cool part of the Trollblood mythos and such a powerful impressive CHARACTER beast, that he clearly deserved a characterful model - that was more than just a plastic mauler with a new face. I did some looking around and found a few REALLY cool beer drinking raging and genuinely impressive Rok models, but I kept coming back to the big bad extreme version. 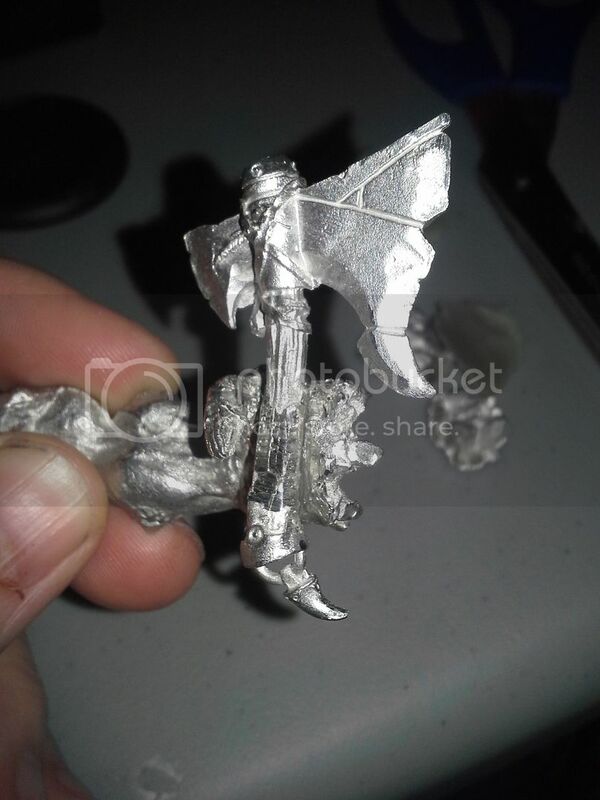 I had one recurring problem with the extreme Rok conversion's that I was able to find and that was around the axe hand. Some people clipped the axe and put it in the wrong hand, which was a strange idea that I still don't really understand given the nature of the game rules. Other builders cut and pinned the axe to the correct hand - which I understand is probably the easiest answer, but given the tightly clenched fist doesn't make it look like he is properly holding it . Or the most sensible but still difficult way was to cut off the extreme hand, attach the Rok hand and try to smooth the zone to match it up..... which basically leaves him with one less detailed and smaller hand. To me, the solution seemed straightforward - none of these would suffice. Instead I started by sawing and clipping away all of Rok's hand and carving the remaining metal so that it was shaped in a way similar to the rest of the axe handle. Yeah...umm that was .... not....fun. On any level. But it sure as hell looked cool when it was finished and on the table. 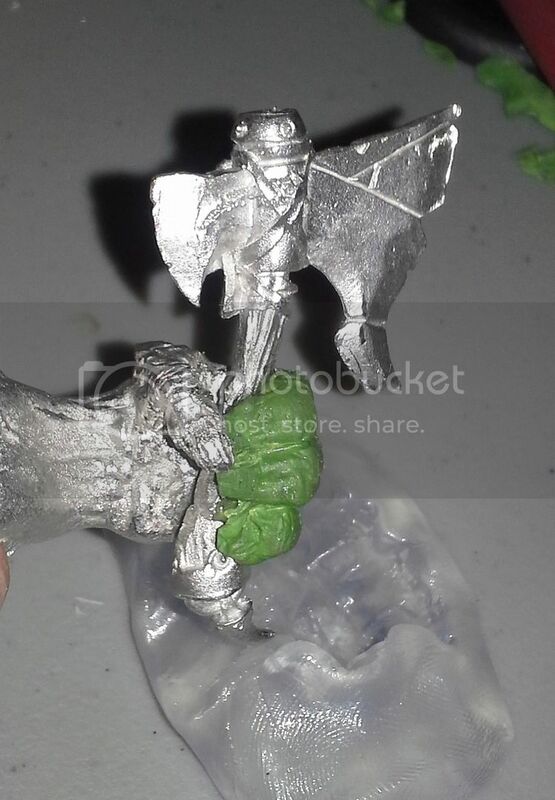 Next I took Instant Mold from CMON and took an impression of the fingers and knuckles of the extreme mauler hand. This stuff is really great and I am finding all kinds of uses for it in my conversion work. I could have simply resculpted the fingers and matched them up, but this cut a ton of time and made sure the fingers matched up perfectly to the original sculpt! Once I was sure that my press mold was good and the resulting fingers were dry I set about cutting the original fingers from the extreme fist. I was careful to cut on angles and work slowly so that I could maintain the integrity of the thumb. this made gluing the axe into place much more easy. once that was secure I trimmed, bent (GS is flexible!) and fit the greenstuff fingers into place. Now I had an extreme Rok who was properly holding his axe! Next was a bit of simple gap filling around the back and arm joints and then to make him a bit more EXTREME I gave him more hair and a MORE EXTREME BEARD! This was now a Rok with a beard so fine that even Kris Aubin would be proud to sport it! Then again..... Perhaps one more model first. That way I could end up with a heck of a battle group for P3.